Handling Tips: 40° F. Keep cool and dry. 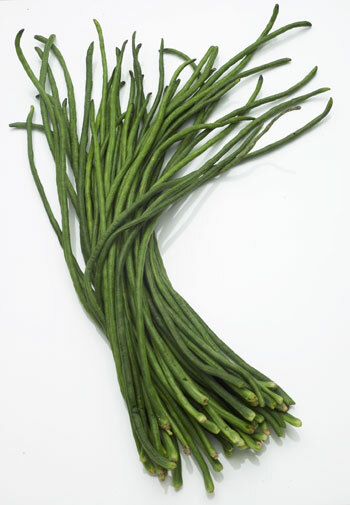 General Information: Yard long beans have been cultivated for centuries in India and China. They grow in a dark purple and drak green variety. The dark purple bean is meatier and sweeter than the dark green bean, which has a less delicate taste. Interesting, tasty, yet a difficult bean to ship. Very susceptible to "rusting" when shipped and a difficult bean to build a menu around. However, having said that, it is a superb bean when stir-fried or sauteed. It's length is also a benefit to the very creative chef who can twist, turn and bend the bean into many configurations. Rich in vitamin A. History: Yard long beans have been cultivated for centuries in India and China. This variety is unusual and recognized for its beautiful purple color pods. A generous producer of 16"-20" long beans that are soft textured. The bean's purple color is retained even when cooked. These beans are tender and stringless, and can be used with meats or with other vegetables in quick stir-fry dishes. In addition to the pods and seeds, the young leaves and stems are also edible when lightly steamed.